Pemaquid Point is a rocky outcrop on the southern coast of Maine. It is a well-known tourist attraction, and comes complete with a frequently photographed lighthouse. Nice as the lighthouse is, my interest was the colored layers of stone that reach like long fingers into the sea. I have collected rocks since I was a kid. In fact, I have boxes of them. Every once in awhile, I’ll drag those boxes out from where they are stored, and go through each and every stone. I admire their beauty. I like thinking about their geologic histories; like people, each one has a fascinating story. And I enjoy remembering where I was, and who I was with, when I picked up each one. 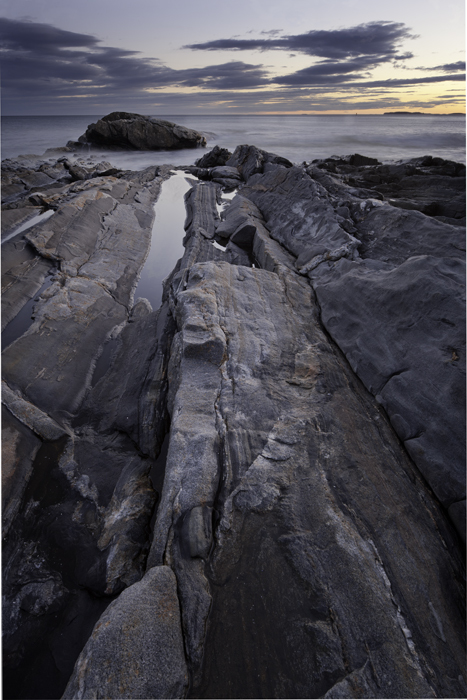 The rock formations at Pemaquid Point are visually striking. I arrived just before sunset. Skies were clear, except for clouds on the horizon, and these were richly colored in gold with just a slice of rose at their base. Long joints, cracks if you will, in the rocks, directed my eye from shore, out to a protruding mass of rock upon which incoming waves crashed, and then beyond to a distant island. Hues of red, orange, and lavender in the rock layers beautifully complemented colors in the sky. I photographed at a low angle to accentuate the lines, patterns, and textures. Reflections of the clear sky above by water caught in the rocks were pools of silver.